the seasons have officially transitioned from summer to fall here in our neck of the woods. however, the temperatures have been so cool lately that it has felt way too cold to be autumn. where is my nice fall weather hiding? as we transition seasons we transition our food too. we're setting aside the strawberries and peaches of summer and picking up autumn apples and pumpkins. 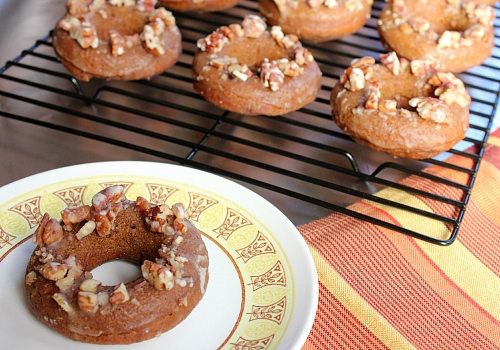 to welcome fall, we made a batch of baked pumpkin doughnuts this weekend. i just love baked doughnuts. they are so easy to make (maybe a little too easy) and they don't have all of the heaviness and grease of fried doughnuts. these doughnuts are wonderfully cakey. the spices really stand out and complement the pumpkin so well. after we baked the doughnuts we dunked them in a brown butter and apple cider glaze. 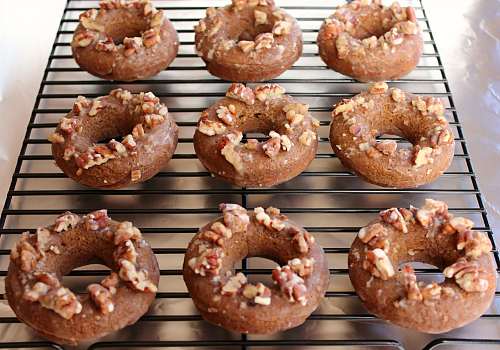 before the glaze set, we topped the doughnuts off with toasted pecans. wow! we shared them with my parents after we went apple picking and to roba's farm on sunday. 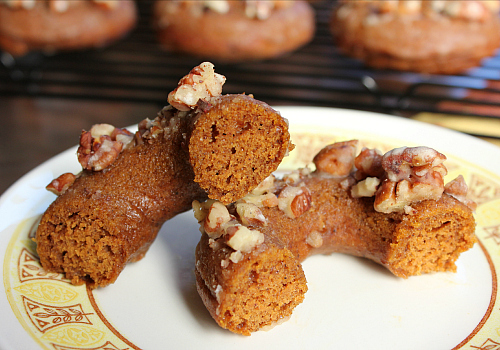 they were a great fall treat! 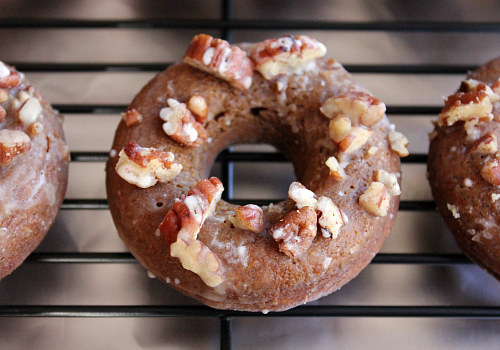 ps: if you're looking for another great fall doughnut recipe, try our baked apple cider doughnuts too! preheat your oven to 325 degrees F. sift the flour, baking powder, spices, and salt together into a large bowl. in the bowl of an electric mixer, whisk together the pumpkin, sugar, egg, oil, and vanilla. gradually add the sifted dry ingredients to the wet ingredients and whisk until combined. spoon the batter into a piping bag and cut off the tip of the bag. squeeze the batter into the molds of a greased doughnut pan. fill about 1/2 way full. bake for 13 minutes, or until a toothpick inserted into the center of one of the doughnuts comes out clean. once baked, allow the doughnuts to cool in the pan for 10 minutes, then carefully remove them from the pan and allow them to cool completely on a wire cooling rack. to make the glaze: melt the butter in a saucepan over medium-low heat until browned. pour the browned butter into a bowl with powdered sugar, apple cider, and vanilla. stir until it reaches a smooth glaze consistency. dip the cooled doughnuts into the glaze. place the doughnuts on a wire rack with either aluminum foil or waxed paper under the rack in order to catch the dripping glaze. top with chopped pecans. They were very delicious. Great pumpkin spice flavor and not too sweet. Plus they look pretty.